What exactly does shearing entail? Until we got the alpacas, I had an image of wiry lads clipping sheep with big scissors while jig music played in the background. And hey, maybe that’s how they do sheep, but alpacas, not so much. For the last two years, Scott Dontanville of New West Shearing has done our animals, as well as the neighbors’ and a friend who lives down the road (all on the same day). Frankly, we adore him and his son Connor. Shearers are in high demand, often scheduling half a year in advance, and the popularity has gone to their heads. But despite the fact that Scott has the skills and equipment to shear circles around most of them, he and his son are friendly, helpful, and approachable. It’s a joy to work with such truly good people. Anyway, I’m clearly a Scott fangirl, but what makes him so great (other than his personality), is his method. While many shearers throw the animals to the ground and shear them there, Scott uses a method pioneered in New Zealand, that is much less stressful for the alpacas. 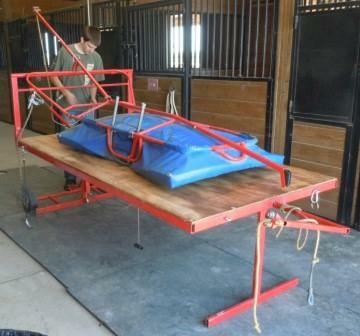 The trick is this fancy, custom-built shearing table. The padded blue thing raises up, and the table itself rotates so it’s vertical. 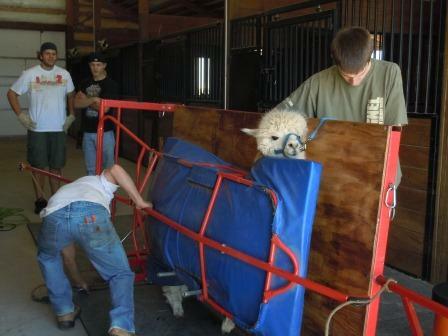 You walk the alpaca in between the table and the padded thing, and then lower it down. It sandwiches the animal in. Then you rotate the table flat again! Tuscany there doesn’t even look distressed. 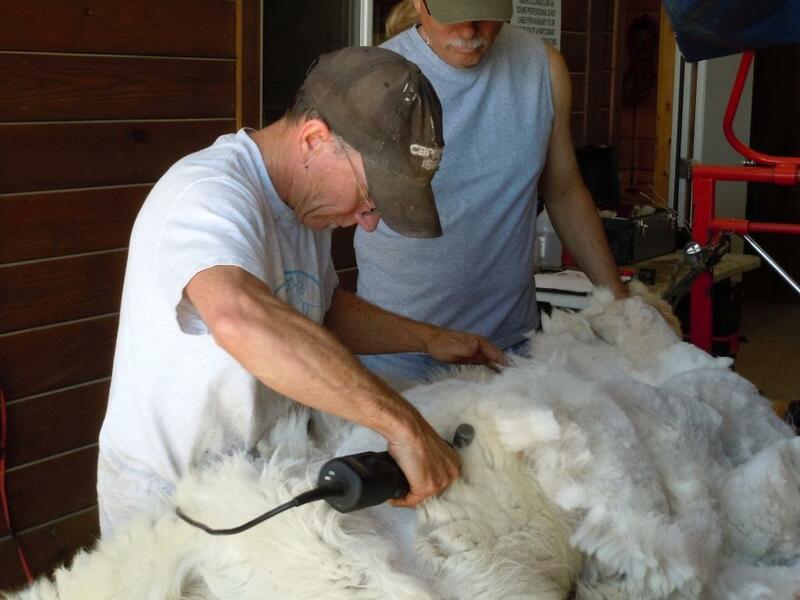 Scott starts by shearing one strip up the animal’s shoulder. 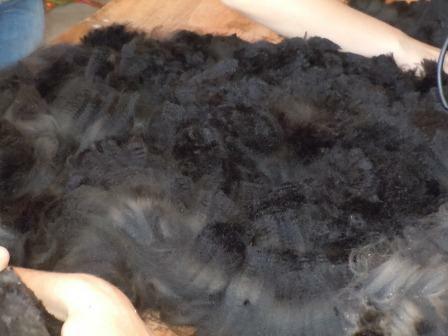 That fiber goes into the “legs and neck” bag, which is used for felting and other coarser applications. Then he begins to separate the blanket, or prime fleece, from the animal by running across the belly. He works his way across the belly, side and back in long horizontal sweeps, and the blanket folds over the back, where someone (me) catches it. I carefully pull it up onto the top of the table, moving it out of Scott’s way and trying to keep it intact. When he gets to the spine, we pull the blanket off, scoop it up, and roll it into a bag. Each animal takes about 20 minutes! 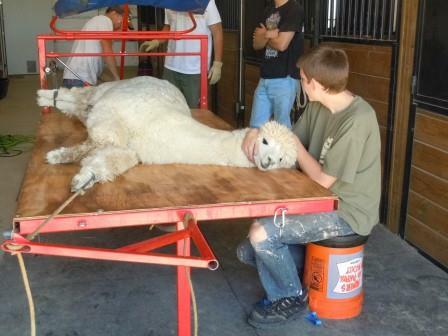 This entry was posted in animals and tagged alpaca fleece, alpacas, fleece, shearers, shearing. Bookmark the permalink. Thank you Kirsten, this was really interesting!